Fran with the six point buck she shot on Remembrance Day 2017. 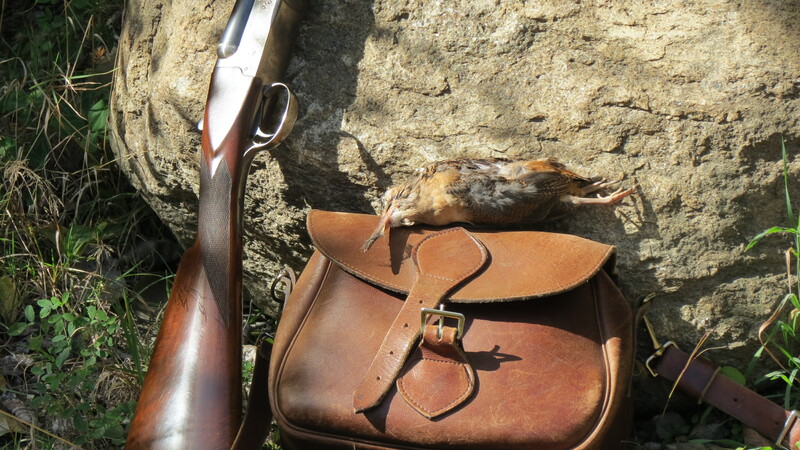 This entry was posted in Big game hunting, Firearms, Guns, White-tailed deer hunting and tagged Browning X-bold Medallion, Cooper rifle, deer hunt, deer hunting, doe, Frances Quinn, Hunting, Jason Quinn, Omer, Ontario Ministry of Natural Resources, six point buck, Spencerville, spike horn buck, white-tailed deer, white-tailed deer season on November 14, 2017 by geoffreyandmika. 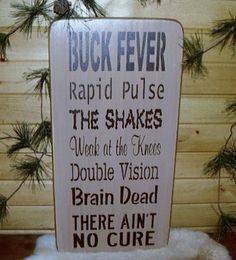 Is there a remedy for buck fever? The reason I ask is because before yesterday afternoon I foolishly thought I was immune to this affliction that sometimes strikes deer hunters. Yesterday afternoon’s deer hunt with my friends and hunting buddies Jason and Fran, a happily married couple who share a passion for deer hunting, started full of promise. 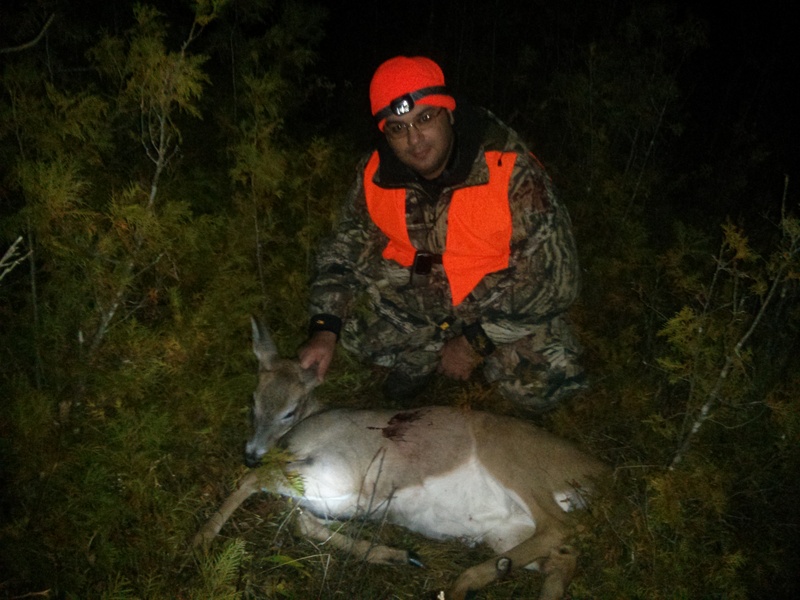 Omer, our friend and hunting buddy, shot his first deer (a button buck) on the opening day of the rifle season in Ontario. I saw a doe that same afternoon, but passed up a shot as I had a buck tag. We tagged Omer’s button buck with my tag, leaving us free to fill Omer’s doe tag in party hunting. I saw another deer the second afternoon Omer and I sat, but not enough of the deer to risk a shot. The third afternoon we sat, I did not see any deer from my stand, but as we made our way back to the car two deer bounded across a meadow ahead of us in the dark. There are deer in the area. 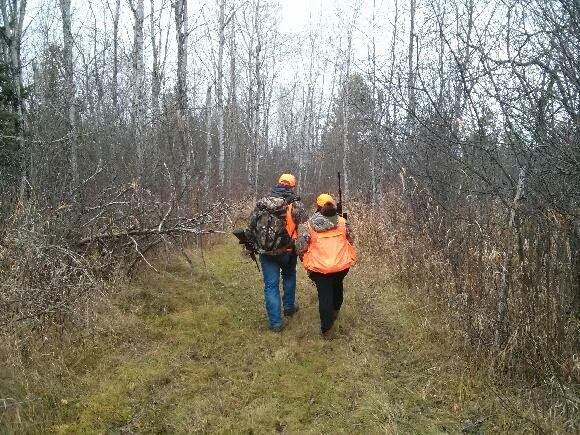 The husband and wife who deer hunt together, stay together. 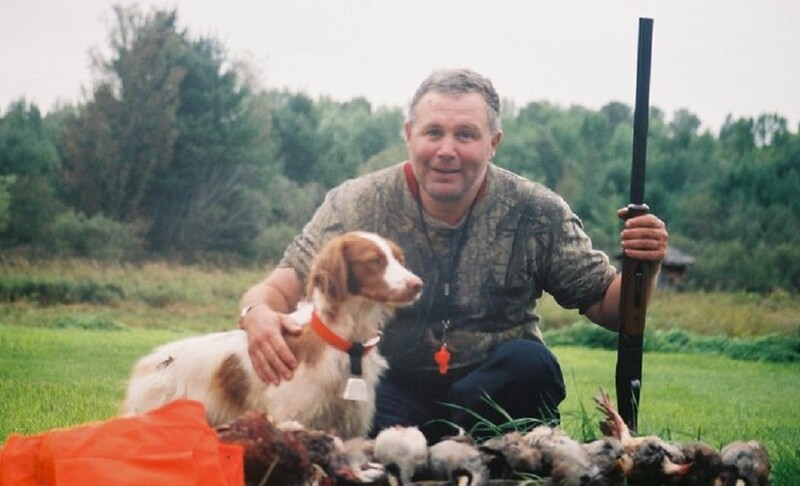 This entry was posted in Big game hunting, Hunting dogs, White-tailed deer hunting and tagged buck, buck fever, deer hunting, deer stand, doe, hunt, Hunting, porcupine, rifle season, white-tailed deer on November 8, 2015 by geoffreyandmika. Omer with his first whitetail deer. This entry was posted in Big game hunting, Firearms, Guns, White-tailed deer hunting and tagged buck, button buck, coyote, deer hunting, doe, rifle season, white-tailed deer on November 3, 2015 by geoffreyandmika. 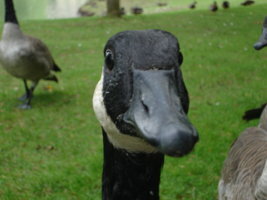 This entry was posted in Big game hunting, Canada goose hunting, Duck hunting, Guns, Hunter safety, White-tailed deer hunting and tagged buck, Canada goose, Canada goose hunting, deer hunting, deer season 2014 Ontario, doe, Frances Quinn, goose decoys, goose hunting, hunting season, hunting seasons, Jason Quinn, Maurice Quinn, Omer, Ontario, rifle season, Ruffed grouse, Russell, six point buck, Spencerville, trail camera, white-tailed deer, white-tailed deer season on November 9, 2014 by geoffreyandmika.